How to Make Statement Beaded Jewelry. Over the weekend, I actually set some time aside to zone out, play, learn and make something new. 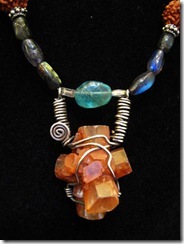 I have made wired beads before for various beaded jewelry pieces, but I never made a largish wire-wrapped center bead. So, I played with some of my beading, wiring jewelry & other craft resources and when I got inspired, I designed a jewel of a bead! It was fun and easy. The pebble that we found at the beach will have a new home. I learned a few lessons over the years of making beaded jewelry, and I thought to share these with you here. 1. Loop It Twice. loop it horizontally twice so you won’t lose your stones. 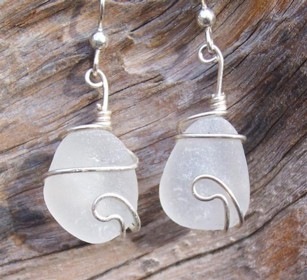 Just look at the large coral bead in this necklace by Nichole W. Kennedy, or even these wired sea glass earrings which I spotted at Linda Schneider’s OdysseySeaglass.com. Tip: the criteria for necklace centerpieces are really different than for earrings. For example, you want something large for your necklace, but for earrings, it’s best to use really light beads as weight matters a lot. Yes, there are a lot of tips and tricks to make good beaded jewelry. Start today, learn as you go. 2. Use Useless Curls. Unless you use strong & firm wire, curls should probably be ornamental rather than structural. 4. Double It Up. if you have thin wire, go with double or triple layers at a time. 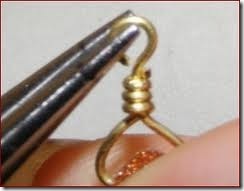 Pick the right wire width for your stone to get it to look right. 5. Finishing Matters. Make a secure hanging loop at the top or back. This is how you finish the top to use your bead as a necklace center bead. 6. 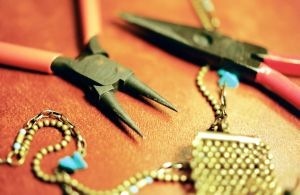 Wire Wrap Tools. . Use good Jewelry Making Tools , e.g. to flatten the metals against the shape. 7. Be Relaxed. Don’t be in a hurry making jewelry. Take your time. 8. Whimsy Works. I find that just free-form, no pressure doodling brings best results. 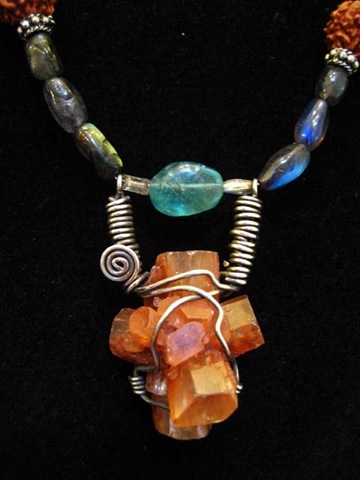 See this pendant here by Silvia Peluso. Her centerpiece feels so right: whimsical and secure. 9. Themed Approach. Repeat Repeat. Build a theme with your features, and build. E.g. 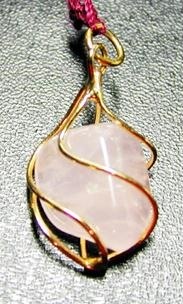 All sides of this ‘cage’ around the rose quartz center bead are swirly. Individually they are just swirls. 5 together make an adorable cage. 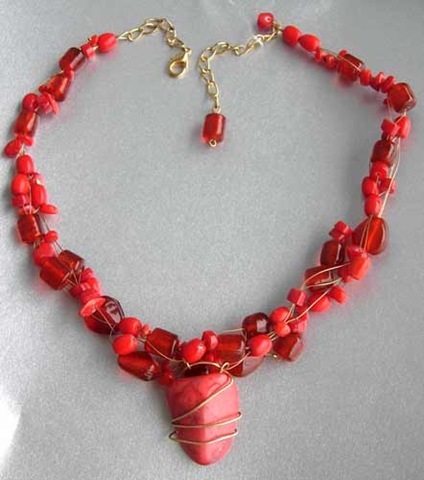 Or, if you wrap with curls, consider making some curls of different sizes and repeat these curls also elsewhere in your necklace or at different parts around the stone. 10. Have Fun. Life is short. This means that when you get all giddy, because you don’t get ‘this thing’ right, it’s probably time to go to the beach and have a refreshing dip in the lake. Bead on a Wire: Making Handcrafted Wire and Beaded Jewelry In this latest book, author Sharilyn Miller shows crafters of all levels how to get in on the popularity of jewelery and beading, with: An in-depth section on design and construction techniques that makes it simple to get started; More than 20 step-by-step bead and wire jewelery projects, including gorgeous earrings, necklaces, brooches of and bracelets; It only takes a few basic steps to start making fashionable jewellery that’s guaranteed to trigger compliments. The step-by-step techniques featured in this richly illustrated book take the beginner who knows little about wirework on a journey to creating artistic and unique free-form jewelery. Using round wire that is readily available and economically viable, wireworkers learn everything from how to hold pliers to how to make ear wires, hook-and-eye closures, and cages for marbles and cabochons. 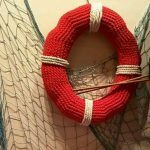 Line drawings, photographs of finished objects, and a wirework gallery of pieces by the author and other contemporary wirework artists provide sample creations and ideas for the innovative wireworker. GREAT tutorial! 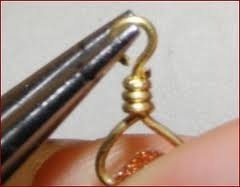 I’ve bookmarked this for after the holidays when I may try and branch out into jewelry crafts. You make it look easy.